Winner will receive a 4.200€ cash prize and the opportunity to work in the Miralles Tagliabue EMBT architecture studio, in Barcelona. Fundació Enric Miralles and Mirales Tagliabue EMBT come together to organize a competition to recycle a pre-existing structure located in souther Tenerife, one of the Canarian Islands, into a thalassotherapy physical health centre. Projects must take into account preexisting facility’s structure, as well as the relationship with the surrounding area. All related material, such as location, blueprint and photographs and Terms and Conditions can be downloaded here. 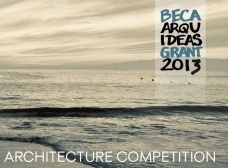 Architecture students and recently graduated professionals are the main public to participate in this competition. It’s an opportunity to problematize housing development and its relation to the real estate industry. Passatge de la Pau 10 bis.